Cambodian police trained by the FBI in anti-trafficking techniques helped save Savoeun when she was lured from her home. Simean knew something was wrong when her 15-year-old younger sister Savoeun failed to show up at the factory where they both worked. With both daughters helping to support their family, even one day off would put a great deal of strain on the family. What concerned Simean the most was a woman she had seen hanging around Savoeun at the factory the previous few days. Simean asked her coworkers where her sister was. The answer sent a chill through her body: her sister said she was leaving Cambodia for Malaysia. Simean then ran to call her mother. She knew time was not on her side. While Simean was alerting her parents, Savoeun was on a motorcycle taxi as it swerved in and out of the chaotic traffic of Phnom Penh. She held tightly onto a plastic bag containing the few items she had been told to take with her - among them a change of clothes and her older sister’s birth certificate. The woman had promised to quadruple her salary if she went with her to Malaysia to take a job as a caregiver. Savoeun said yes - just like a lot of people in the world’s richest nations would if someone offered such a huge rise. But for Savoeun it could have been a fatal mistake. When Savoeun arrived in the capital city, the stark reality became clear. She was being shipped to Malaysia to be sold to the highest bidder. It’s a familiar story of traffickers preying on the desperate. Human trafficking like this is modern day slavery. It touches every country on earth and today, there are estimated to be more than 20 million slaves in the world; more than during any other time in human history. For more than a decade, governments around the world have worked hard to develop laws and responses to the $32 billion trade in human beings, according to U.N. figures. 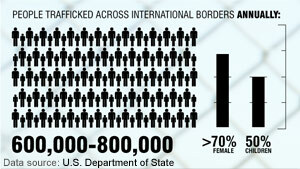 From 2000 to 2012, the United States was a global leader in combating modern day slavery. The centerpiece of that leadership was found in the Trafficking Victims Protection Act (TVPA). 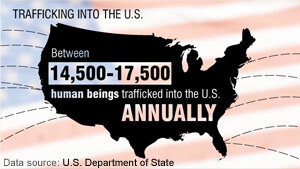 This law directs the U.S. response to human trafficking both domestically and around the world. 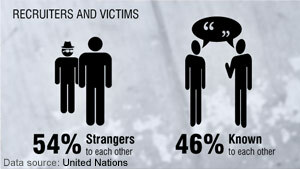 The law emphasizes prevention of the crime; the protection of survivors, and the prosecution of traffickers. In 1999, a 12-year-old girl was taken from Savoeun’s village. She was raped and killed. Community members admit they didn’t take any action because back then, no one knew what to do. After that horrific event, World Vision worked with community leaders and, most importantly, young people including Simean, to empower them to know what to do if someone falls victim to violence, abuse, or exploitation. Over a decade later, when Savoeun failed to show up for work at the factory, Simean put her knowledge to work. She made a phone call and the community jumped into action. Her family contacted their local mayor who called the local police. They, in turn, called the national police and several investigators, who had been trained by FBI agents from the United States, started following every lead they could. The training provided by the FBI was authorized by the TVPA. Two days after she failed to show up for work, Savoeun was able to make a phone call to her uncle when her captors weren’t looking. Within a few hours, the police, her uncle and mother had safely removed her from harm’s way. The community and police credit their training and prevention efforts as being key to finding Savoeun. Without those efforts, it’s possible Savoeun might never have been seen again. Unfortunately, Congress let U.S. leadership lapse when they allowed the previous session to expire without renewing the law. This bill, which has had nearly a decade of unanimous, bi-partisan support, has become just another casualty of the petty political games played by this most recent Congress. In September 2012, President Obama called renewing the TVPRA a “no-brainer.” It is vital that his next administration works closely with Congress to make sure they pass the best law possible for the protection of survivors like Savoeun; prevention through trained communities like Simean’s; and prosecution of traffickers like the recruiter in Cambodia. The lapse of the law is shameful. But there is time for redemption. For those in the U.S., call your Senators and Congressional Representative right now. Three phone calls can help make the difference between children like Savoeun finding freedom or slipping into the darkness of modern day slavery. Now we just need to pull our factories out of China, and no more slavery. This is Malaysia, but what about places like Saudi Arabia? There're slaves all over the world in places that are lacking in the human rights department. But it's also a cultural issue, slavery isn't frowned upon in other parts of the world. So what's one to do? Just like most of the worlds problems, there is no real solution. It'll keep happening regardless of law changes, sanctions, interventions, etc. thanks for the rather deep analysis of slavery which i'm sure we are quite well aware of. now, if you are a US citizen, pick up the phone and call. If you call, things might be better a little but if you don't, then for sure it will not get better. the choice is yours. Are you kidding me? In addition to directly combating the practice, encouraging economic development in these countries is the sure fire way to end this practice. The reason these people are able to tempt these children away from their families in the first place is because of the lack of economic opportunities at home. Progress means going forward, not backwards. This article has nothing to do with China. What intentions are you harboring? Slavery still exists here in this country. Foreigners are brought in to be "house slaves" and are "paid" less than a dollar per hour to work 24/7. It's more wages than they'd make in their own countries, but abusive conditions according to "civil" standards. 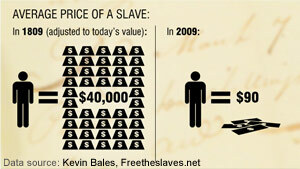 Ironically, it's the rich that 'possess' these foreign slaves, but nothing is being done about it. This exists here, and many do not know it. While on a Federal Criminal Grand Jury, we investigated and indicted people in several cases in the Bay Area. Slavery is what big business is all about.If big business were about humanity and fellow man they wouldn't be exporting our jobs to slave labor countries like Mexico,India and China. That's strange, the 2nd amendment was ratified to PRESERVE slavery. You can make lots of rational arguments for or against the 2nd amendment...that's not one of them. Try again later. I fully support bringing in outside outside arguments to a different topic...but that's just a false "argument". The Southern States, the Confederacy, tried to void the 2nd Amendment by "gun control laws," meant to keep firearms and other "weapons" out of the hands of slaves. Silly, there were slave revolts in Colonial and U.S. history! The 2nd Amendment is meant to give all citizens the means to equalize the power of any government. The Southern "leaders" were determined to annul the Amendment, one way or another, even to the point of Secession. You have that right. This very recent attempt by the gun-grabbers to depict the 2nd Amendment as a pro-slavery act just reveals how dishonest they are. If the 2nd Amendment was really intended to preserve slavery, why have we only started hearing about it now? The United States has no business interfering with the governmental, societal, or cultural affairs of other nations. It is not our responsibility to spend our hard-earned tax dollars dealing with problems in other countries. We have plenty of problems here that need to be solved. Why are we spending billions on foreign aid when there are people right here in the United States who are homeless, hungry, and desperate? I'm glad Congress let this law expire. Now maybe we can focus our efforts on fighting crime and poverty right here at home. Open your heart PeaceNow, all these poor countries around the world don't have the resources or proper education to fight this kind of crime. USA, European countries, NZ, Australia, and Canada all stand for humanity and kindness. I'm sure all these poor countries asked or even begged USA for help. I'm sure that these FBI trainings DO NOT costly like the lost Wars in Afghanistan and Iraq. FYI, Cambodia is very friendly to USA and Western European countries, they have not done 1 thing wrong to the West. Their descendents spread thru out North America and European countries. What are we doing about the human smuggling and slavery in the United States? To combat the underground in human trafficking requires dedication and money. Republicans don't want to spent money to have the Government(s) do their duties and responsibilities. They proudly proclaim their efforts, being fellow travelers with slavers and human traffickers. Just how close is the Tea Party and neo-con Republicans to the John Birch Society and KKK? They may not openly proclaim their loyalty to slavery and dictators, but their actions tend to speak louder than their words. Idiot CONGRESMAN again failed to pass ANTI SLAVERY TRAFICING LAWS. What is the use US taxpayers pays your big salaries year after year. Wish somebody will published those names who did the failure. it is important as to WHO the slaves are. Implicit in all this is America's responsibility to impose its version of morality upon the lesser races. Sure, I think human trafficking is terrible. But I'm just as sure that these outrages will eventually motivate local people to take more direct and lasting action against those in power who directly and indirectly through corruption pray on their children. Without this, we're just competing with the criminal elements as to who can provide the biggest bribes while the local officials learn to play both sides – and take Americans for suckers. game. What outcome you get by playing it like 12 hours a day. Small amount of items get increase and you’re happy with that. game. YES!! Unlimited Items and you will not have to play the countless hours in order to beat your friends or family members. then this Clash of Clans Hack website is for you.